Stepping through a time portal into 1716, historian Penny Saunders didn’t expect to get stranded in the past. Five years later, now a pariah to the townsfolk of Three Star Island, she endures solitude and ridicule until a hurricane tosses a dangerous castaway onto her shores. William Payne’s history precedes him. Pirate, outlaw, and ruthless captain, he’s a monster among men. . . or so it seems. Desperately seeking redemption for his blood-soaked past, he upends Penny’s world by showing her a passion she’s never experienced. But time is closing in on them; the governor of the Carolinas has rescinded his pirates’ pardon, the locals are growing suspicious of Penny’s new houseguest, and she can’t keep her secrets from William forever. When everything falls apart, she must use both wits and weapons against lawmen and pirates alike to save the one man who would tear down the world for her. Penelope stood in the crater the time portal had sliced into the tree line. Sheared-off branches sprouted new growth overhead, and grass choked the scorched ground, concealing most of the sand that had been fused into glass globules by the rift. Frowning, she dislodged one of the spheres with the tip of her shoe and kicked it into the dunes. This gate hadn’t opened in months. Two days prior, a hurricane had ravaged Three Star. Alone on the southern tip of the island, Penny had ridden out the storm in her farmhouse while gales ripped up centuries-old live oaks by their roots and tossed debris through the walls of her outbuildings. She’d seen a time gate’s flicker in the immediate aftermath half a mile from where she now stood on the beach, but there had been no reason to dash out into the dwindling rain in hopes of reaching it before it shut. None of them would let her go home again. Grasping her skirts in one hand, she made her way through the oat grass to ascertain what the storm had offered her in compensation. The summer of 1721 had been a blistering one, providing scarcely any rain to offset the heat. With few thunderstorms of much note, ships in the area had enjoyed a season of calm, returning to port with full holds and happy sailors, and Penny’s larder suffered for it. Without wreckage to pick through, she’d survived on meager rations from her garden and the bones of a sloop that ran aground on the shoals to the south. Yesterday threw one more long, hard bout of rain at the island, keeping her inside until dusk. Now, with the sun a few hours into the sky, she hurried to collect her share of the shattered remains of dead men’s fortunes. This time, she was determined it wouldn’t bother her. She tucked a short strand of hair behind her ear, knuckled her glasses higher, and proceeded to the shore. The sea mirrored the heavens, flat and tranquil. Whitecaps lapped the sand, pulling back to reveal a stripe of broken shells stretching as far as she could see. Currents funneled past the rock barrier jutting out into the water, and a smattering of planks and splintered crates gathered on the sand bars the rising tide would soon submerge. Penny stooped to dip her fingers into a mountain of sea foam. Lacework-white and delicate, it dissolved at her touch. A flicker of movement caught her eye. Slanting toward the beach on a downdraft, a laughing gull shrieked its peculiar, broken cry and swooped over a figure lying in the surf. Her stomach dropped. The waves had disgorged a body. Straightening, she fidgeted with her apron strings. The tide was rising. Soon, the ocean would reclaim the life it had taken, leaving no trace of the drowned man behind. Here, he was alone and unknown. Somewhere else, however, he would be an empty seat at a hearth, a bed half-filled, a promise unkept. Like her, he could never go home again. Penelope sighed. Unable to bury him, she could at least bear witness to his return to the sea. Keeping close to the water, she trudged toward him. She stopped when his arm moved. It was a tiny motion she could’ve mistaken for a trick of the wind, his sleeve toyed with by the breeze, yet when his fist clenched the sand, she was certain. 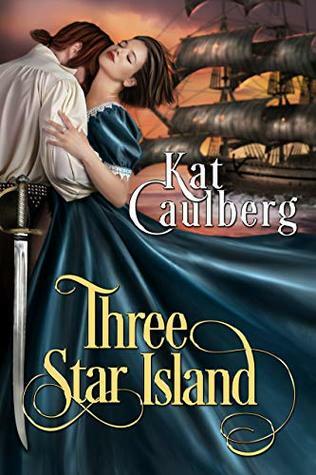 For as long as she can remember, Kat Caulberg has been obsessed with history and the paranormal. Somewhat to the dismay of her parents, her interests led her into both museums and graveyards as a child, a trend which has continued into her adulthood. This has influenced her reading tastes and her writing, whether it be a good ghost story, thrilling tales of time-travel, or devouring endless volumes of ancient warfare. 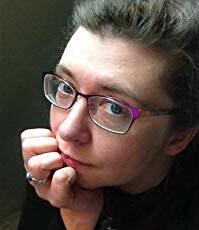 She signed a contract with Soul Mate Publishing in 2018 for her first novel, Three Star Island, a time-travel story set in 1721. She enjoys writing strong, quirky heroines, and has a weakness for cheeky heroes who have as much compassion as they have flaws. Kat currently lives in North Carolina with her Englishman and a few cats. Love this cover. Thanks for sharing the excerpt It sounds like a good book.